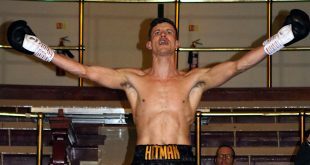 Last Friday the 13th at the Mountbatten Center in Portsmouth, England produced a night of boxing that will be hard to beat anytime this year in terms of excitement. Topping the Frank Maloney promoted bill for ʽFriday Fright Nightʼ was Tony ʽOakey Kokeyʼ of Portsmouth and Dean ʽDeanoʼ Francis from Basingstoke. The fight was billed by many as a ticket to a world title shot and with the British and Commonwealth titles at stake, that was no exaggeration. The home fighter entered, wearing black and grey trunks to his favoured tune of 'Ohh the Oakey Kokeyʼ and with him was the FA Cup as his personal lucky mascot. The crowd going wild gave him a huge reception and also their own version of the Oakey Kokey, which no doubt would fire him up even more. 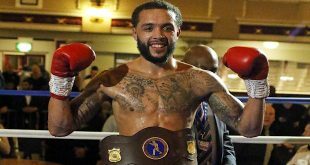 His opponent, Dean Francis, entered also in black and grey trunks, looking much the more powerful of the two men, his physical condition certainly one of the finest specimens in boxing today. The first round, if anything, was deceptive of the fight that was to follow. Neither fighter was particularly dominating, with Francis working behind the jab and Oakey trying to work his way in and go the man from Basingstokeʼs body. In the second however, Oakey's high work rate and high pressure attacks seemed to already be getting to his man. Cutting and wobbling the Commonwealth Champion, Oakey took the round by a large margin. The third round followed suit with Oakey again forcing all the action and fighting his perfect fight. ʽDeanoʼ seemed off the pace and unable to deal with the Portsmouth man's come forward, relentless style. Two rounds to one, Oakey, after the third. In the fourth, Francis' cut was reopened and Oakey was actually appearing to be the stronger man despite his knockout record being somewhat inferior to his opponent's 23 knockouts in 29 wins. Oakey's most dominant phase of the fight came in the fifth round as he nearly put Francis on the canvas, continually pressuring and making his opponent uncomfortable. Francis seemed almost uninspired while Oakey seemed a man driven by ambition. The crowd continually chanting the Oakey Kokey throughout obviously were driving Oakey to glory with their passion and superb singing skills! Despite landing two heavy rights, which Oakey walked straight through, Francis also lost the sixth round, again being outworked and on the back foot throughout. Oakey was well ahead in this fight by now at about five rounds to one. Rounds seven and eight saw the wind change, with Oakey visibly slowing as if in-between rounds he had ʽhit the wallʼ. 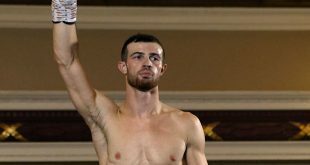 Francis landed his best combo of the fight, however the desire of Oakey enabled him to again just walk straight through the punches and keep outworking his man. The ninth stanza of the fight produced the shock of the night as Francis, despite looking exhausted, was actually connecting more than he had done in any round before and the lack of head movement from Oakey was allowing Francis his chance back into the fight. He took it, and floored Oakey with a massive left hook which left the Portsmouth man dazed as he took a knee before getting up. Despite doing the sensible thing and waiting to get up, like Ricky Hatton before him, it was not enough and with no legs under him, Oakey could only try to hold on and hope. However the man who had knocked out over two thirds of his opponents obviously wasnʼt having any of it and the referee was forced to kill the dream for Oakey at 2:47 of the ninth round, propelling Francis to a possible shot at a world title sometime soon. After the fight, Oakey, 25-3-1 (7), showed his class as a person, raising Francis' hand and stating he was sorry that he couldnʼt win for his fans. Francis, 30-3 (24), was a gracious winner and also declared that he is looking to land a world title opportunity in the near future. 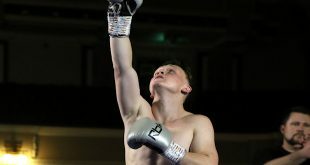 On the undercard, light middleweight Sam Webb, 11-1 (3), beat Paul Dyer, 18-9 (1), by a wide points margin in a thrilling six rounder, and super feather Henry Castle, 18-4 (10), stopped Lee ʽCookieʼ Cook, 9-1-1 (3), in the sixth round, ending the Londoner's unbeaten run in the process.